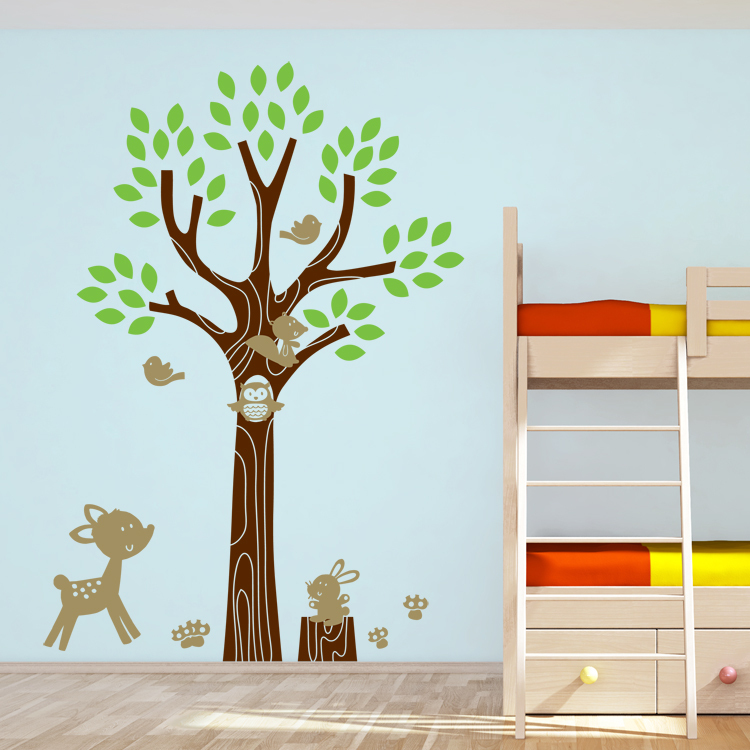 Turn your child's room into a forest wonderland with out Friendly Forest Friends and Tree decal! Our wall decals are ideal for offices, living rooms, entryways, classrooms, even your car or glass shower doors! Layout as shown: 67 inches wide by 98 inches high. Tree with leaves as shown: 63.5 inches wide by 98 inches high. Tree alone: 40.5 inches wide by 85.5 inches high. Animals range in size from 7 inches wide by 5 inches high (birds) to 18 inches wide by 24 inches high (deer). Colors shown - Dark Brown Matte, Kelly Green Matte and Light Brown Matte. The tree comes in several labeled sections for easier application. All animals come separately so you can create your own look! Comes with 50 individual leaves. I ordered the fairy with dandelion and the name in script decals for my 1 year old daughter's bedroom. The decals were very easy to apply and looks like someone painted a mural on my daughter's wall. If you click my URL you can see pictures of our decal in my daughters room. We got a wispy tree with pink flowers it MADE the room. It was a lot of work to put up but definitely worth it. Everyone that comes over absolutely LOVES it. I'm a huge fan of Dali Decals--not just because of their awesome products, but also their amazing customer service! It's so nice to shop with a company that values its customers' input and feedback. I love the interaction on their Facebook page! Every time I've placed an order with Dali Decals, it ships right away, and my box is always loaded with little extras. The staff at Dali Decals goes out of their way to make their customers happy, and it shows! I'm a Dali fan for life--as long as there are walls around me, they will be covered with really cool decals! I just received my order, actually earlier than I expected. The packaging is great. No damage at all. It is beautiful! My daughter will be so suprised when she sees this in her room. Thank you so much. I will definitely order again and absolutely recommend to others.